Alright, here's this month's original character contest! Instructions--and I quote--"All we need is a drawing of the character and a brief biography describing the background of the character and the situation. " Topic: What sort of musical instrument does your character play? OOH I want sooo badly to enter!!! TT^TT I hope that my college will lighten up on me soon. Hmm... I'd love to enter too, I've actually already gotten a character drawn in pencil, but I have to drop him in photoshop and color in him and the background... that takes time... ... stupid physics... well I just scanned him in and I'm hoping that I am given a great copious quantity of time to my disposal. Probobly will end up doing that, err... but later... at which point it may already be colored. Not sure what I'll do for mine yet. Knowing me, I might enter half-way through or near the end of the month. Who knows? Hmmm.... I think I've decided on an instrument. Now I just have to think up a character and find the time to draw the picture. Not an easy task. If only I didn't have schoolwork. Do entried have to be coloured/shaded or is lineart stuff okay? Come to think of it, does it have to be a single character as well? Yes, you can have more than one character, I think; and yup, it can be just linework, as far as I know from the previous contests. ^_^ Though I think it could be a good idea to try and point out who the main character of your entry is somehow. At least in the description. Mmm, oh I've got several ideas, but it only for hand drawn or can it be a edit, (ie. cut & paste photoshoped image)? What is the power of the weak and the weakness of power? What would the butterfly effects be with an OC with no chakra or ninja inclinations but a coveted special sensing ability? But that's not her only closely guarded secret. Psst, don't tell the hyper blond boy she hates ramen. Yes! just in time, I got a scANNER WOOT! I'm pretty sure that since it's an Original Character Contest, you need to draw the character yourself. It can be done on the computer, or on paper and scanned in, but you'd have to ask Jaden Mental (he's the judge) if you can use cut and pasted edits. Excellent! Congrats on getting a scanner, Ice! Ok, I have a question, where do we submit our entries for the contest? You submit them in this thread, or post a link to the entry here. I've got a prelim sketch done, so hopefully I'll actually be able to enter this month. Let's see lots of entries this month! Ganbatte! Ganbatte to you to! (And yes I do know what it means, so I'm not just repeating you for show or anything ). Go for it! Glad to hear that you've got one in progress, SA. I look forward to seeing it! Ahem, ok, so I'll have to submit my character design for Tengu in a reduced JPG or PNG later this week... one that is quite a bit less detailed but a LOT smaller. 26 MB is going to kill photobucket and my 56k line. But now to work on the bio! Contemplates ebil things, soon... SOON you shall see za vord Tengu!!! bwah ha ha hah ha!!!!! You're welcome. Glad to hear that there are other nefarious plans being made. Can't wait to see what their results will be. Well, I've the got the picture sketched out, and I hope to get it inked and colored later today. We're allowed to use the same character for multiple character design contests, right? I present now, my entry for the CAA Febuary Character Art Contest... Tengu!!! MWAH HA HAH HA HA!!! IT IS DONE!!! I HAVE UNLEASHED TENGU ONTO THE WORLD!!!! Somewhere in the land of Ellasia, cast beyond our shadows and the hidden places of our deep dreams sits the great old hermit Tengu. 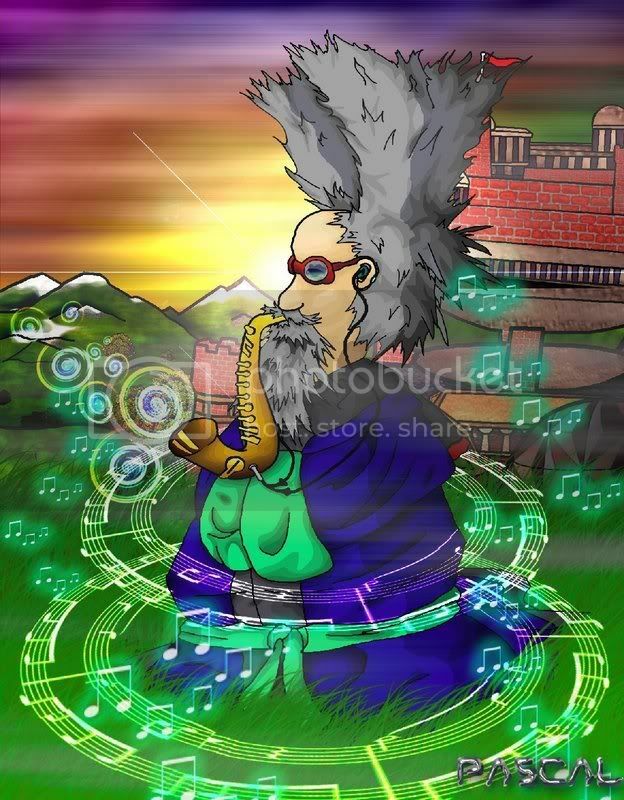 Perched upon his mountain vista, the magician musician pulls a tune seemingly out of his birdâ€™s nest of a hairdo and begins to whittle away the hours with the cutting edge of keen musical insight. As the sun bows out and the evening skies shatter the eastern heavens of this odd world; Tengu continues forth with one final sonata to the day and breaks the peaceful surroundings with brilliant luminaries and creations of his mind. Tengu, even for his odd looks, is an esteemed ruler of the nation of Ellasia, by the side of Rei and Kairi. Oddly, only Kairi is considered a native of Ellasia, Rei fell into Ellasia from an airship and Tengu always lived among the mountains as the local hermit. He greatly enjoys all forms of music, but is creating a fusion of jazz in this piece. He has the odd peculiarity of often having small trees grow up around him wherever he sits which often tangle him up. However, currently he is lacking this annoying attribute, which has caused him much trouble and little aid since childhood. He is very fond of animals as they were his only true companions in all of his years of solitude and he often waxes philosophical about any number of topics. If he must fight, he uses a giant sword that is larger and heavier than even Cloudâ€™s Buster Blade and his resonance with nature allows him to cut down several trees at once with the mighty blow of his weapon. Overall though, he is a champion of peace and at this momentâ€¦ music. Mwhahaha, that hair! I love it Pascal! The time and detail you put into the shading is apparent and the various effects are cool. Nicely done! That's really cool! Love the vivid colouring and detailed touches in the environment too. Would say more, but am feeling tired and have only skim-read Tengu's bio. ^_^" What I read sounded cool though. Thank you for the comments and encouragement ladies! And yes, Tengu and Johnny Bravo use the same hair spray .